Blog about Business Intelligence,Data Science and Big Data Technologies. As folks are getting comfortable SQL Server 2012, In some cases I have heard that users want to bypass SQL Server 2012 and upgrade straight to SQL Server 2014 from SQL Server 2008. One of the big attractions is use of in memory technologies across the OLTP, Data warehousing and BI platforms. There not been much of improvements in SSIS and SSRS but SSAS/BI has got some new features. Please check the following link for all the features and the product itself. 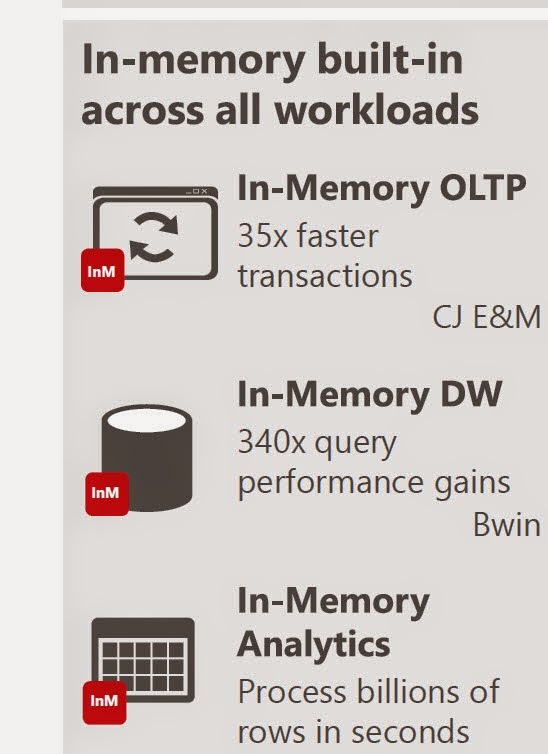 The image below was taken from the SQL Server 2014 Data Sheet...which talks about In memory across all workloads. Hope one of these days I will get to install and evaluate SQL Server 2014. Our training videos feature the most current technology. Ramdas Narayanan, Currently Working as a Business Intelligence Architect with focus on Microsoft BI Stack using SQL Server 2008. Prior to SQL Server 2008 worked on SQL Server 2005/2000, Have 4 years of experience with Hyperion Essbase and SAS,a total of 15 years of experience in Relation Database Management Systems.